The Government Should Own the Gedeo IDP Tragedy and Respond Accordingly! One year ago this month, Dr. Abiy Ahmed was sworn in as prime minister of Ethiopia. His first few months in office saw many positive human rights reforms and a renewed sense of optimism following several years of protests and instability, along with decades of repressive authoritarian rule. Thousands of political prisoners have been released, a peace agreement has been signed with neighboring Eritrea, and Abiy has pledged to reform repressive laws. But in the months that followed, growing tensions and conflicts, largely along ethnic lines, have resulted in significant displacement and a breakdown in law and order across much of the country, threatening progress on key reforms. This week we will publish a series of assessments of Prime Minister Abiy's first year in office, looking at his government's performance regarding eight key human rights priorities and providing recommendations on what more needs to be done in his second year in office, leading up to elections scheduled for May 2020. Today, in Part 8 of 8, we look at the government's performance on Conflict and Internally Displaced Persons. All of the progress in other areas threatens to be undone by the dramatic breakdown in law and order much of Ethiopia is experiencing. While peace with armed opposition groups and neighboring Eritrea is positive, increasing conflict along ethnic lines, rising tensions, the significant number of Internally Displaced Persons (IDPs), and the lack of any evident plan by the federal government to calm tensions is very worrying. Ethiopia's government needs to urgently restore security and take confidence-building measures to calm tensions. While there have been various skirmishes over the years along ethnic lines, often over access to land or resources, ethnic tensions were for years suppressed by the EPRDF government. An extensive grassroots surveillance system allowed it to suppress any emerging threats to its power and control. Humanitarian and development assistance in Ethiopia is usually channeled through different levels of government. The government has in the past used access to assistance, including to jobs, seeds, fertilizers, training opportunities, and food aid to ensure loyalty to the ruling party. These tactics were so effective in part because the EPRDF controlled all levels of government from the highest levels in Addis down to kebele [village] levels, making it relatively easy for party policies, philosophies, and intelligence gathering to be easily implemented across the country. Arbitrary arrests and use of excessive force to control protests were used when other systems of control and suppression did not work. Protests began in 2014 and 2015, triggered by the Addis Ababa Master plan, which increased concerns about ongoing displacement of farmers around Addis. The plan proposed to expand the municipal boundaries of Addis Ababa twentyfold in order to manage the capital's rapid growth. Ethiopia's government has been faced with various small-scale armed insurgent groups. Serious conflict between the ONLF and Ethiopian army between 2007 and 2008, and violence by the Somali Region Liyu police since 2009 in the Somali Region of Ethiopia claimed many civilian lives. The Ethiopian military's counterinsurgency operations against the ONLF between 2007 and 2008 were marked by gross human rights abuses, including war crimes. In the year leading up to Abiy becoming prime minister, tensions between ethnic groups, and between security forces and protesters, increased dramatically. Hate speech, both online and offline, increased and vocalized criticism against the ruling TPLF increasingly translated into hate speech directed at ordinary Tigrayans. There were more and more reports of attacks against Tigrayans located outside of Tigray. Conflict along the Oromia-Somali Region border left over 1 million people displaced and many people killed. Tensions along ethnic lines over complex questions of identity led to loss of life in areas across Ethiopia. The opening up of political space has allowed Ethiopians to express long-standing grievances, often over land, border demarcations, access to state resources, and perceived discrimination against their community or ethnic group, without fear of retribution. Local governance and security have sharply deteriorated in many locations. This lack of law and order means there are few constraints on how grievances are expressed. In some places, this has resulted in score-settling, clearing of rival groups from land and housing, and open conflict between ethnic groups. For example, in West Guji Zone of Oromia, Guji aggression against Gedeo forced hundreds of thousands of people, mostly Gedeo, to flee their homes from from April to July 2018. Gedeo IDPs and humanitarian actors told Human Rights Watch the government pressured IDPs to return to unsafe areas, restricted delivery of humanitarian assistance in IDP areas, and pressured humanitarian agencies to provide food aid in return areas to lure people home. At the height of the displacement in July, there were approximately 900,000 IDPs. In Harar there have been reports of some Oromo youth clearing Hararis from their homes. And tensions are high between the Amhara and Tigray Regions in part over the disputed areas of Qimant, Wolkait, and Raya. A proliferation of firearms and entrenched positions from regional government officials over these areas have exacerbated rising tensions. In Jijiga, capital of the Somali region, a youth group known as Heego, which is loyal to the region's former president Abdi Illey, and the region's paramilitary Liyu police carried out attacks in August that left many people dead. The Ethiopian Orthodox church said eight of its churches were burned, and more than 15 people, including seven priests, were killed. Hundreds of people reportedly took shelter in a church compound after their homes were destroyed. Across the country, over two million people are currently internally displaced due to conflict, including 1.4 million in the first half of 2018, more than anywhere else globally. 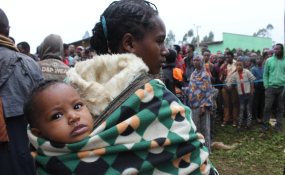 There are now over 1,000 IDP locations in all of Ethiopia's regions. While some initial steps have been taken to increase the independence of institutions that have the mandate to resolve grievances, these institutions are not yet seen as independent enough to resolve such complex challenges. Peace agreements between the government and the OLF, Ginbot 7, and the ONLF were finalized in August and October, although the terms of these agreements have not been made public. Fighters from these groups who had previously been living in exile returned to Ethiopia. Conflict in the Somali Region and Liyu police attacks against civilians subsided with the removal of Abdi Illey and the appointment of Mustafa Omar. Skirmishes between Oromo and Somali militias and other armed groups continued sporadically. There were a variety of clashes around Moyale involving multiple actors, including government security forces from the federal government and both Oromia and Somali regional governments. The International Committee of the Red Cross was invited back to the Somali region for the first time in 11 years and distributed emergency relief assistance in conjunction with the Ethiopian Red Cross to people affected by intercommunal violence. Complex and politically charged issues around who manages the ongoing growth of Addis Ababa, and clarification of constitutional provisions around Oromia's "special interest" remain unanswered and are a growing source of tension. These tensions increased in February when the Oromia regional government announced its plans to demolish 12,000 homes "built illegally" on the outskirts of Addis. At least 30 people died in the outskirts of Addis in September, after several days of violence fueled in part by the return of some exiled, previously banned, politicians. At least 23 people were killed in the violence and security forces killed several more during a subsequent demonstration. Issues around the demarcation of zonal and regional borders has also increased tensions. While there are provisions in federal and regional constitutions that allow for the creation of new regions and zones, they were not successfully invoked under the previous government, and there is a lack of clarity around how those provisions might be implemented. In the Southern Nations, Nationalities, and Peoples' Region (SNNPR), made up of over 40 distinct ethnic groups, at least ten groups have petitioned the regional council to form their own regional states, starting with the Sidama who petitioned the regional council in July. There are concerns this could lead to the "balkanization" or break up of the SNNPR. In other parts of Ethiopia, there are calls for some zones and woredas to move from one region to another. The Abiy government's main response to these moves for greater autonomy from some groups was the creation of the Administrative Boundaries and Identity Issues Commission in December. A law was passed to formulate the commission, and commission members were later announced, many of whom were not aware they had been appointed. According to the law, the Commission is to make recommendations to parliament and to the prime minister through analysis of the "causes of administrative boundaries conflicts, self-government and identity issues." The government has not publicly made clear the mandate or current status of this committee. The regional government of Tigray and several other groups have decried the commission as unconstitutional. Ethiopia resumed diplomatic ties with neighboring Eritrea in July and signed a peace deal that opened the border in September. The number of Eritreans leaving the country to cross into Ethiopia increased dramatically at that time, many of them women and children. The government needs to take urgent steps to restore law and order where it has broken down. Risks of violence around national elections scheduled for May 2020, an obvious flashpoint, are greatly increased if they occur in a context of insecurity. Confidence-building measures are needed. Abiy should announce a plan with specific timelines and deliverables for resolving these issues. Greater presence of federal security forces is needed in some areas although must be done with sensitivity given the federal security forces' record of abuse and role in exacerbating some local conflicts. The apprehension or arrest of members of armed groups should be done in accordance with the law. Individuals involved in acts of violence against other communities should be charged in accordance with Ethiopian law, with respect for due process and presumption of innocence. The government should refrain from any forced return of vulnerable IDPs. Humanitarian access should not be used to facilitate population movements or forced returns. Ethiopia should ratify the African Union Convention for the Protection and Assistance of Internally Displaced Persons (Kampala Convention).